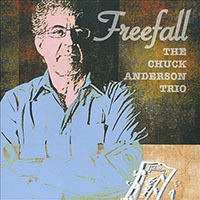 Freefall, by The Chuck Anderson Trio , 2010. Dreambox Media, DMJ-1121. Freefall is guitarist/composer Chuck Anderson’s first release after an extended hiatus from performance due to ill health. However, it is a triumphant and welcome return to the contemporary straight-ahead jazz scene for Anderson and his newly assembled trio featuring bassist Eric Schreiber and drummer Ed Rick. Freefall consists of twelve original tracks, ten of which feature the trio and two solo guitar pieces. The album effectively covers a wide breadth of the harmonic and emotive possibilities available in the tonal jazz idiom. From the exuberant, bright Lydian theme of “Flight,” to the swaggering Mixolydian feel of “In A Misty Glow,” and the dark, serpentine Locrian orientation of “Diablo’s Dream,” the trio genuinely captures and communicates the nature of each tune. The variety provides a fine overview of Anderson the composer. The production only helps to convey the message; the guitar tone is clear and crisp, the bass vibrant, the percussion packs a punch, and the balance between all three is ideal. Freefall is a unique conception, given a sense of unity and cohesion by the trio’s attention to each tune’s inherent musicality, the communication between players, and the successful integration and incorporation of all three instruments as essential elements in the greater musical tapestry.